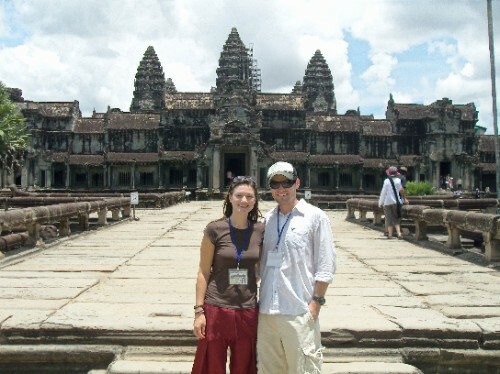 Blog from Siem Reap, Cambodia | Where is the Love? We left our Bangkok hotel promptly at 7am the first morning of the trip and boarded our private, air conditioned mini bus with drop down tv set and started to watch a video.This was alright Hannah and I agreed.It was nice that someone else was organising everything (that would be Haing our friendly Cambodian guide for the next 12 days) and we did not have the stress of deciding where to go next.Honestly it is hard to decide some times. The bus trip was smooth for the 4 hours to the border and then it all changed in a blink of an eye.Once we acquired our Cambodian Visa we walked under the Kingdom of Cambodia sign at the border town of Poipet.The difference between Cambodia and Thailand was stark.The road was now a mud track, the buildings a little less advanced looking, the vehicles a little less new looking, some even had oxen at the front.Not long here and we boarded a Cambodian bus for Siem Reap. In fair the bus was a little older than it's equivalent on the Thai side but the road was night and day. Highway 6 was 4 hours of mud surface, with the biggest pot holes you can imagine.Every bridge was being repaired and the make shift mud blockages were treacherous.Added to this there did not seem to be any standard set of road rules; it took us 15 minutes to work out they drove on the right hand side of the road!The scenery at the road side however was incredible however.Row after row of green paddy fields, children sitting on top of water buffalo, tall houses on stilts, 3, 4, 5 people on a motorbike, 4, 5, 6 sacks of rice on another all fascinating it was almost enough to make me forget how sore my bum was. Then suddenly after 4 long hours we arrived at Siem Reap and there were rows of big 5 star hotels.They came out of no where and their presence and number unexpected.Siem Reap is the known gateway to the temples of Angkor and they obviously attract a great number of tourists to support the number of hotels (although I can only assume the tourists who stay in those hotels fly and don't arrive via the road we just came along). Our hotel for the next 3 nights was not as grand but plush for us with air conditioning and en-suite. The town of Siem Reap was very quaint and had plenty of nice restaurants and bars within a small block along with two pleasant markets to keep the tourists occupied.We enjoyed a traditional dinner of Khmer food (very like Thai but not as spicy) and a few drinks at the appropriately named Angkor What? Bar to set us up for a full day of temple viewing the next day. We visited 4 temples.Angkor Thom and interior Bayon site was fist up.Incredible, huge faces all carved out of stone.The guide talked us through the intricate engravings on the wall detailing the wars and lifestyle of the time, there was also lots of monkeys in the grounds that you could feed.We then headed to Angkor Watt itself.It was breathtaking (almost as much as the heat).The scale was surprising, just enormous and again the intricate carvings on the wall impressive.After this a local lunch and a lot of pestering from the local children.One girl of about 5 had memorised all the capital cities of the countries from where people visit.She knew every one of the nationalities of our group which included Scotland, England, New Zealand, Australia, Czech Republic and Germany as well as a few others I quizzed her on.This impressed me enough to buy some post cards, 10 for $1. In the afternoon we visited Ta Prohm, of Tomb Raider fame.This was different as the temple had not been cleared of the large trees that had started to grow from within the buildings.The ruins and trees seemed intertwined.The final temple we visited was Bonteay Sei.This was an older temple made of brick and not sandstone which had led to the carvings being better preserved.A little tired by know we stopped at one final temple for sunset and a cold beer, $1 from another child merchant, before returning to the hotel. The following day we visited the Tonle Sap fishing village.This was a village built in the middle of the lake with all the houses and public buildings on stilts.The depth of the water varying throughout the year depending on the season, only two here wet or dry.We were met by a band of local children who took us on a canoe trip round the mangrove forest where we could swim.Being here allowed us to see how the villagers lived.Pigs and chicken living on floating rafts, children bathing in the water, no electricity, but everyone so happy and friendly. From Siem Reap we headed to Kompong Chang on another long bus journey.Still at least the roads from here were tarmac.